Woohoo! 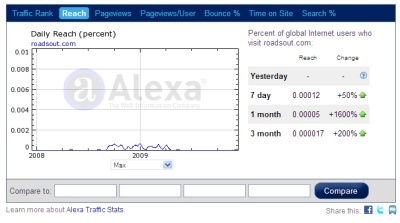 RoadsOut.Com is showing some promise after the 'great black out' a few months ago when the site was gone for a whole month without any updates. I'm pretty delighted to see the current trends of improvements on user based visits on the site. If this keeps up I'll be obliged to get a decent host again for the site and upload the proper Joomla Base that I have worked out for it. I'll be sure to add some new treats on the site if it becomes are reality. Lets see, time will tell.